This page provides an introduction to the internal context and background of CometVisu and is aimed primarily at developers. CometVisu has been built on the Qooxdoo framework since version 0.11. The Qooxdoo Framework offers its own object-oriented class system (including advanced features such as: interface mixins, class separator, singletons, simple type-checks for properties, etc.) with which a complex yet structured software system can be built. It also provides a full toolchain (Qooxdoo generator) that automatically resolves class dependencies and builds either developer versions (source version) or releases (build versions). Parts: Parts of the code that are not always needed are offloaded to Parts, which are reloaded when needed. 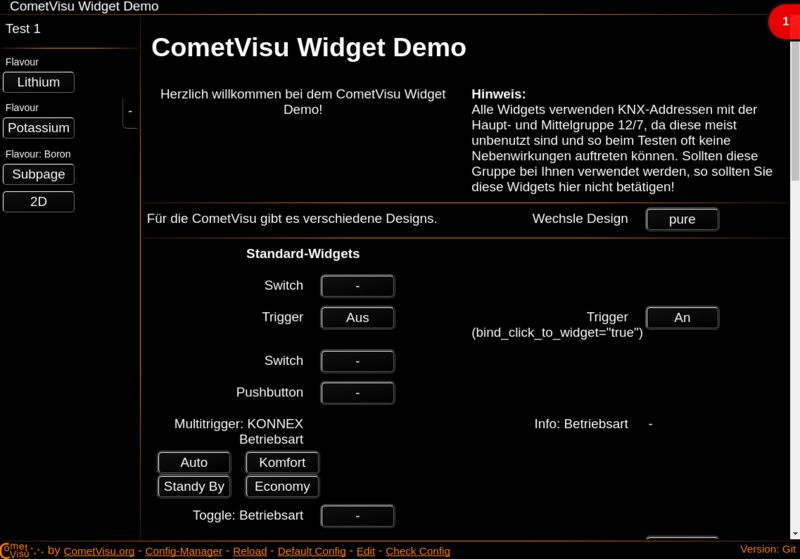 The CometVisu uses this for plugins and widget packages (although there is currently only the Pure widget package, others are possible). 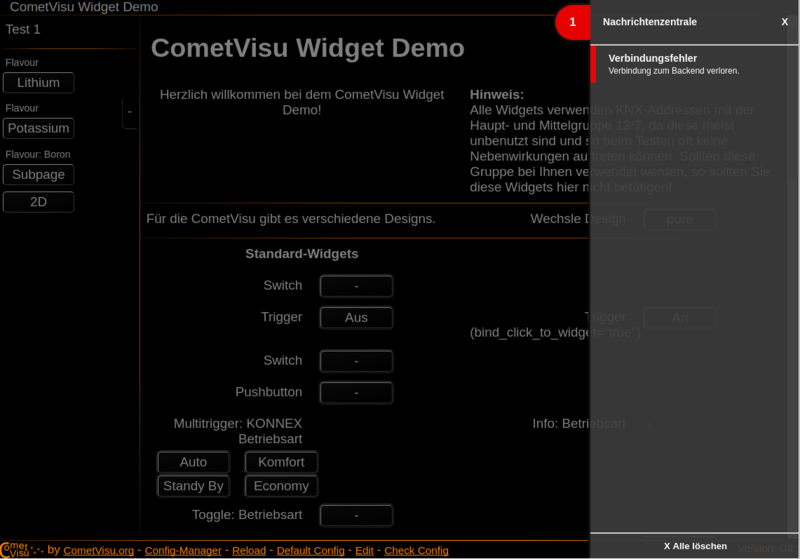 Since the CometVisu provides its own widgets including layout and CSS-based design, the complete UI part of Qooxdoo is not used. This provides its own layout manager and widgets with non-CSS-based design. However, it would be possible to implement a new Qooxdoo-UI based widget package, which can be used in parallel. X-CometVisu-Backend-LoginUrl: Path under which the client can log in. X-CometVisu-Backend-Name: The name of the backend to use. The CometVisu starts to query the values from the backend, initially all necessary values and in the second step only changes of the values are listened to. The transport layers are responsible for communication between CometVisu and the backend from the moment of the successful login. The main task is to retrieve values from the backend (read request) and send value changes to the backend (write request). The CometVisu uses its own caching mechanisms to accelerate the initial loading. Most of the time is needed to load the XML configuration file from the server, then parse it and generate the HTML code that represents the actual Visu in the browser. Since the content of the configuration file usually rarely changes, it is wise to not reloading and parsing it each time. Therefore, after the first parsing, the generated HTML and the internal data structures are stored in the LocalStorage of the browser. The next time the Visu is loaded, this data is read out and the interface is displayed immediately. Only then the Visu asks the configuration file from the server and compares whether there has been changes. If this is not the case, the currently loaded file is discarded, otherwise the parse and save process is performed again and the data from the cache is discarded. Caching can be influenced by the URL parameter enableCache - Activate Caching. There is an internal NotificationRouter which is used for different purposes. The main function of this router is to receive messages and forward them to the right recipient. Possible receivers are e.g. the NotificationCenter and the PopupHandler. Both then take care of displaying the message, either in the message center (which appears on the right and displays a list of messages) or as a pop-up. A message always has a Topic, which serves the thematic assignment, a title, text and various configuration options. Further errors, depending on the type, are displayed either as a pop-up or as a message in the message center. An important example would be connection problems with the backend. These are displayed as long as the problem persists and disappear automatically once the problem is resolved. The NotificationRouter is also used for the notifications.